The D750 is a great DSLR camera. Its AF system is fast and effective. Our tests reveal that the D750 controls noise very well. Full-frame photography used to be the preserve of professional photographers, but DSLRs like the Canon EOS 6D and Nikon D610 have made it a more realistic proposition for amateur and enthusiast photographers. Nikon’s latest full-frame camera, the D750, sits above the D610 and below the Nikon D810 in the company’s range, giving enthusiasts another model to choose from. At first, the D750 might look too similar to the D610 to be a worthwhile upgrade, especially since it appears to share the same sensor. In practice, the tilting screen, improved video features and uprated image quality are worthwhile and the D750 stacks up well against its rivals both in the Nikon camp and from Canon. At the heart of the D750 is a 24.3-million-pixel CMOS sensor and an Expeed 4 processing engine. Unlike the 36MP D810, the new camera has an anti-aliasing filter over the sensor. This sensor and processor combination enables a native sensitivity range of ISO100-12,800 with extension settings taking this to ISO50-51,200. It’s also possible to shoot at up to 6.5 frames per second (fps) and record Full HD video at up to 60p. While 6.5fps is a fair rate, some sports photographers may have been hoping for something a bit higher, perhaps 8fps or more, but then that could have meant a much more expensive camera. Videographers will appreciate the stereo microphone and headphone ports along with the ability to fine-tune audio levels in isolation before and during recording. It’s also possible to select the sound range (wide/voice) for adjustment and adjust aperture with buttons rather than dials for smoother, quieter operation. Wind noise can also be reduced when recording with the built-in microphone. The D750 is also unique amongst full-frame DSLRs currently in having a tilting screen (though not full articulating) – another advantage when shooting video in particular. When shooting in Live View or video mode, there’s a handy Zebra pattern display to indicate on the screen which areas are in danger of burning out. The D750 can also output uncompressed footage via an HDMI connection to allow high-quality recording to an external device. Although there are two card slots, they both accept SD/SDHC/SDXC. One can be used as an overflow store or it can operate as a back-up. Alternatively, the camera can send different file types to one card or the other. While the D750 is compatible with the Nikon’s UT-1 and WT-5 for professional-level wireless image transfer, there’s also Wi-Fi ‘n’ connectivity built-in for the speedy sharing of images and wireless remote control via a smartphone (using Nikon’s Wireless Mobile Utility app). Taking the lead from cameras like the D5300 lower down in the range, the D750 has seven Special Effects modes including Nigh Vision, Color Sketch, Miniature Effect, Selective Color, Silhouette, High Key and Low Key, which can be applied to stills and movies. Although it’s a full-frame model with many professional features, Nikon is clearly pitching the D750 at enthusiasts too, using the same broad control layout as the D610 and D7200. The changes to the Picture Control system introduced with the D810 are here too. These includes the new Flat Picture Control mode that produces video footage (and still images) with less contrast, giving greater scope for post-capture grading. There’s also the Clarity control, which enables the micro contrast of images to be adjusted to give the appearance of stronger shapes and outlines, with less risk of halos and over-sharpening problems. Nikon has used a monocoque construction for the D750 and by using a combination of magnesium alloy and carbon fibre has given it a good solid feel without excessive weight. The camera feels comfortable in the hand and has enough weight to make it feel durable without being too heavy for long shoots. It’s reassuring to know that the camera has the same degree of weatherproofing as the D810. Inside, there’s a Kevlar/carbon fiber-composite shutter, which has been tested to 150,000 cycles. The mirror and shutter movements have a slightly dampened sound; it’s not quite the same sound as the D810, but it’s about the same volume. The D810 and D750 are far more discreet than the D800. Control and design-wise the D750 looks almost exactly the same as the D610. There’s a mode dial on the left of the top-plate that has the addition of ‘Effects’ for accessing the Special Effects modes. As on the D610, this dial has a lock button that needs to be pressed to allow it to be rotated (a lock that can be clicked on and off would be preferable and less fiddly to use, though). On the back of the camera, the control layout is very similar to the D610’s, but the Info button is to the side of the thumb-rest rather than towards the bottom of the camera; meanwhile, the Live View button and switch are lower down in the space created by moving the Info button. The function of a couple of the buttons to the left of the LCD screen has also changed in comparison with the D610, since the bottom one is now an ‘i’ for information control. 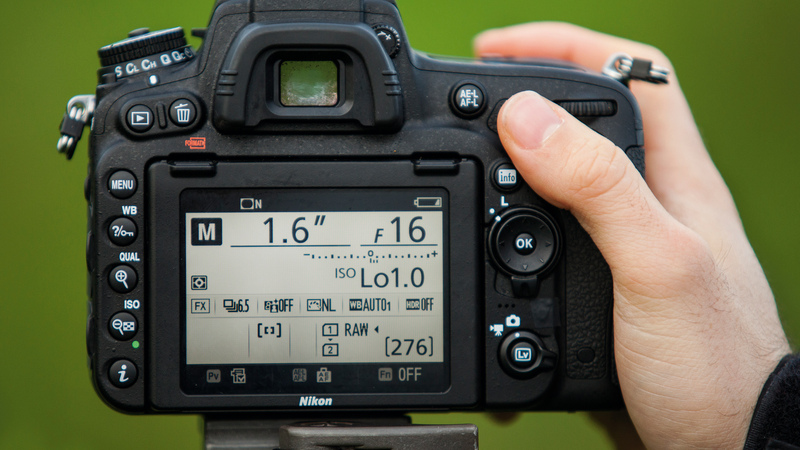 When the ‘i’ button is pressed a list of features appears, as on other recent Nikon SLRs. However, they are now arranged in a list rather than a grid. Unfortunately, there are still a couple of oddly placed customisation options (for example Assign Fn button and Assign preview button) in this list. I can’t understand why these are in a quick access-type menu instead of being restricted to the main menu – customisation is usually a once-only action. It also seems strange that Nikon couples the ‘i’ button with an ‘Info’ button. Pressing the ‘Info’ button reveals the camera’s key settings and it would seem logical to make this interactive so it becomes a route for making adjustments. This would leave the ‘i’ button free for some other purpose. Like the D810, the depth of field preview and function (Fn) buttons on the front of the D750 can be set to act as aperture adjusters in order to enable silent changes to be made to aperture while shooting video. However, I found it helpful to set the Fn button to activate the electronic level in the viewfinder to help ensure horizons are straight. Naturally, as the D750 is an SLR, there’s also an optical viewfinder for composing images. This isn’t the brightest that I’ve used, but it’s still pretty good and it covers 100% of the field of view so there shouldn’t be any nasty surprises around the edges of the frame. If time and subject permits, however, I recommend using Live View when focusing manually. In summary, the controls on the D750 are generally logically arranged and within easy reach, but Nikon could do with applying a little more thought to the use of the ‘i’ and ‘Info’ controls. It also seems that video is finally finding a more comfortable position within a stills camera. Nikon has given the D750 a new Multi-CAM 3500 II autofocus (AF) module, an updated version of the one in the D810. This has 51 AF points, 15 of which are the more sensitive cross-type and 11 that operate down to f/8, which is especially useful for photographers who want to use an extender with their telephoto lenses. As in the D810, the new Group Area AF mode is available to help when shooting subjects that are comparatively small and against a high-contrast or distracting background. The AF performs superbly when matched with a decent lens. When using a Nikkor 70-200mm f/2.8, for example, it gets subjects sharp incredibly quickly and is capable of tracking the subject around the frame when the appropriate mode is selected. The fact that it’s sensitive down to -3EV means that it’s also useful in low-light conditions and in many situations it still manages to latch onto subjects quickly. Enthusiast photographers are a demanding bunch – they want to be able to shoot all sorts of subjects in a wide variety of situations and get top-notch results. On the whole the D750 won’t disappoint these users. It’s extremely capable and can deliver superb, sharp images with natural colour, perfect exposure, plenty of detail and well controlled noise in a wide range of situations. Exposure metering is handled by a 91,000-pixel RGB sensor and this enables face detection metering even when the image is composed in the viewfinder – although rather unhelpfully you are unable to see when a face has been detected. I have yet to come across an infallible metering system, but the D750’s Matrix metering system is very good. During my testing it managed to deliver perfectly exposed results even when shooting some very bright subjects like yellow backlit leaves. This doesn’t mean that the exposure compensation wasn’t required on a few occasions – it was, but never when I wouldn’t expect it to be and it wasn’t needed on a few occasions when I thought it might. The D750’s automatic white balance system also does a very good job in most conditions. The second Auto setting, which is specifically intended to retain the warm notes of warm lighting, is useful on occasion. But if you really want the warm glow of evening sun to be recorded then the Daylight option is your best bet. Occasionally, there is an inexplicable colour shift of a sequence of images when using the automatic white balance settings and it seems likely that the automatic scene recognition system aspect of the processing is responsible. Like the D810, the D750 uses the EN-EL15 Li-ion battery and when flash is used Nikon claims that it will last for 430 shots. Without flash, this extends to up 1,230 shots. Nikon has also introduced the MB-D16 battery pack to complement the D750 for longer shoots. As it has included Wi-Fi connectivity in the D750, Nikon has gone a step further than Canon with its EOS 7D Mark II for those wanting to control the camera remotely. However, Nikon’s free Wireless Mobile Utility (WMU) app only offers very limited control over the camera. 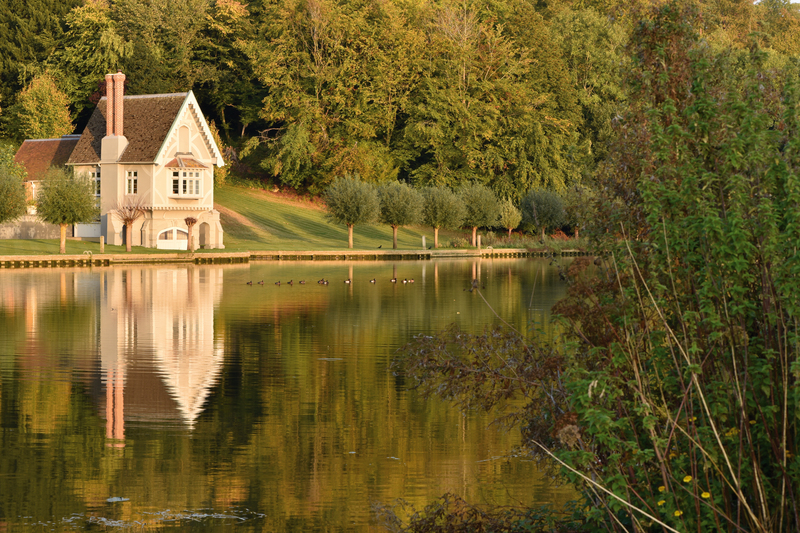 The live view image can be seen on a smartphone screen and the autofocus point can be set with a tap on the screen, but there’s no control over the exposure settings. It is in effect just a wireless remote release with live view. Of course the biggest news about the back of the D750 is that the 3.2-inch 1,229,000-dot RGBW screen (the same as on the D810) is mounted on a tilting bracket. This enables the screen to be tipped up through 90 degrees and down through 75. It doesn’t help with selfies, but it makes shooting movies and landscape format stills at high or low angles more comfortable. It’s a good display that shows plenty of detail. As it has a 24-million-pixel sensor with an anti-aliasing filter, the D750 isn’t be able to match the D810 for detail, but it can record a little more than the D610. This is the result of the development in sensor and processor technology since the arrival of the D610. It’s worth bearing in mind that many consider the D610 a hasty upgrade to the D600, which was only brought about to correct the problem with the shutter spraying oily material onto the sensor. 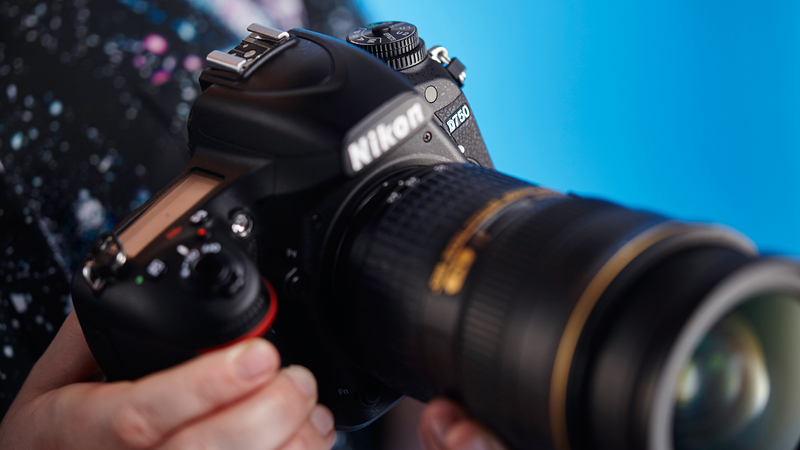 Our tests reveal that the D750 controls noise very well. Even when the noise reduction is turned off in the processing of raw files shot at ISO6,400, there is only a little chroma noise visible at 100%. Step up to the native maximum of ISO 12,800 and chroma noise (coloured speckling) becomes more noticeable at 100% on-screen, but it is still controlled very well and the level of detail is impressive, even in shadow areas. Simultaneously captured JPEGs have no chroma noise, but there is luminance noise and images look at little softer under close inspection. Though dynamic range and detail levels drop off at the expansion sensitivity settings, the results still look pretty good. Even images taken at the maximum sensitivity (ISO51,200) can make decent A3 prints. It’s useful for giving images extra ‘bite’ straight from the camera. I found the results created in the Monochrome Picture Control mode with the Clarity and Contrast (an image-wide adjustment) were often very pleasant. Part of the beauty of the Picture Controls is that they can be used when shooting raw and JPEG files simultaneously and this means you have a full colour file for processing as well as a treated JPEG. Conversely, even if raw and JPEG recording is selected, rotating the mode dial to the Special Effects option results in only JPEG images being recorded. Theses Effects can be previewed in Live View mode. In many cases previewing the image is enough to convince you to not use the Effect. The D750 is a great DSLR camera. Its AF system is fast and effective, its Matrix metering system is very capable delivering correct exposure in a wide range of situations and it produces images that have natural, yet vibrant colours. Although it cannot offer the class-leading detail resolution of the D810, the D750 is more than a match for the D610 in this respect. It captures an impressive level of sharp detail and noise is controlled well – though not always as well as its main rivals. It’s also good to see the introduction of a tilting screen on a full-frame camera – it’s a shame it’s not fully articulating, but it’s a move in the right direction and on a weatherproof system. It has the majority of the features that an enthusiast would want, along with a few modern niceties like Wi-Fi connectivity. There are a few inclusions that seem more aimed at less experienced photographers that could perhaps have been better thought out for the enthusiast, but all the essentials that an enthusiast want are there and based upon proven systems.